The Smithsonian's National Zoo celebrated the debut of their new male Asian elephant named Spike on Friday. And while it was certainly a treat for the zoo, Spike got his own treat as well: a frozen banana tree trunk. WASHINGTON — Now this is the real elephant in the room. Smithsonian’s National Zoo celebrated the debut of their new male Asian elephant named Spike on Friday. And while it was certainly a treat for the zoo, Spike got his own treat too: a frozen banana tree trunk filled with carrots, pineapple, mango, papaya and sugar cane. Video from the zoo’s Elephant Cam shows him exploring his new habitat and playing with elephant-sized curiosities. The 36-year-old pachyderm came from Busch Gardens Tampa Bay in Florida. He arrived in D.C. March 23. The purpose of Spike’s trip? To make a baby elephant. 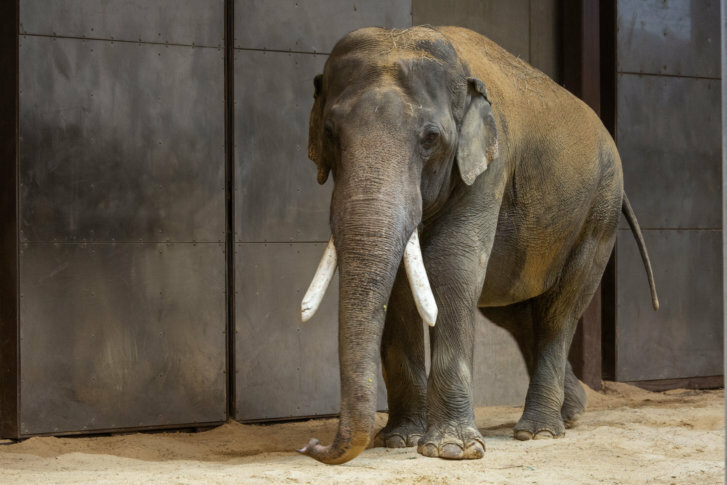 He is in the District based on a recommendation to breed with the zoo’s 27-year-old female elephant, Maharani, from the Association of Zoos and Aquariums’ Species Survival Plan. Spike had previously lived with Maharani — as well as two other females at the zoo, Kamala and Swarna — at the Calgary Zoo. The big guy — Spike weights a hefty 13,000 pounds — was born in 1981. Check out video of his debut below.